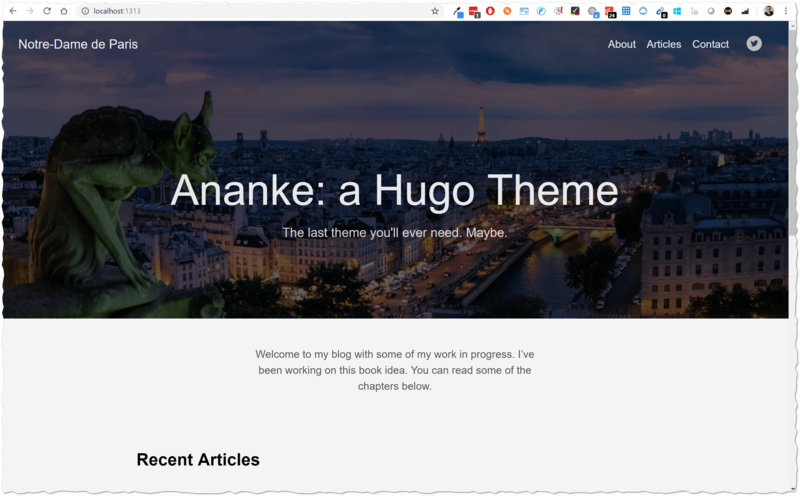 Hugo is a static website generator that I chose because of its simplicity and performance. You write a few lines of Markdown in VSCode, Hugo compiles them literally in milliseconds to HTML. You put the HTML on a web server and you are done. No additional moving parts like databases and pretty small attack surface because everything is static (looking at you, Wordpress plugins!). No parts that I have to patch! Simplicity wins. 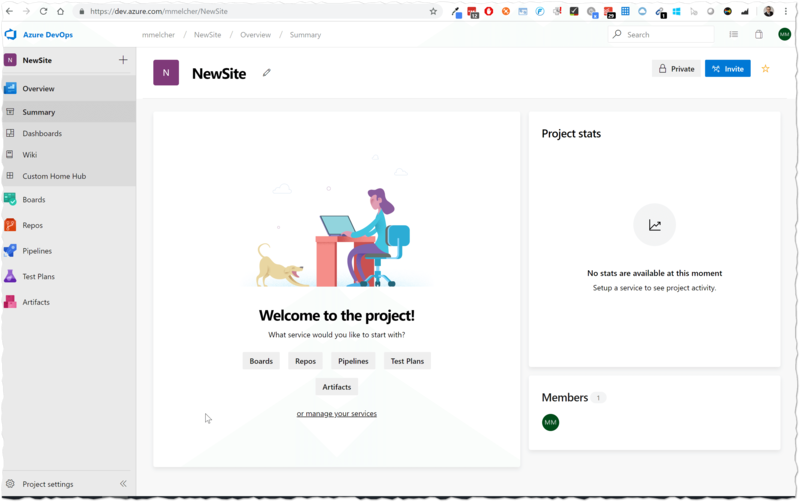 From the publishing side, with Hugo, you get a modern content management system with a great community and awesome features. And because you just write markdown files, you can choose every editor that you want to use. And you can compose them without internet connectivity. You can tell, I am a big fan! Lastly, I use tinypng.com/ to compress my images. And the ‘Check my links’ Chrome extension to quickly check that all links are correct. 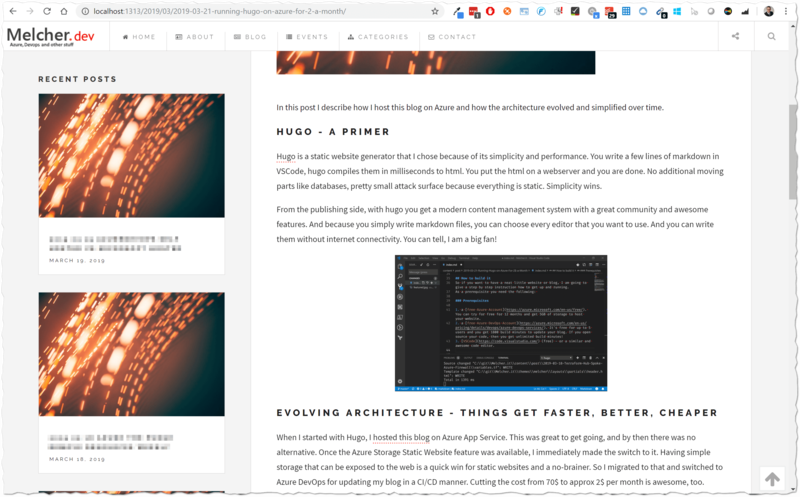 When I migrated of Wordpress to Hugo, I hosted this blog on Azure App Service. This was great to get going, and by then there was no alternative to me. Once the Azure Storage Static Website feature was available, I immediately made the switch to it. Having simple storage that can be exposed to the web is a quick win for static websites and a no-brainer from a cost perspective. So I migrated to that and switched to Azure DevOps for updating my blog in a CI/CD manner. Cutting the cost from 70$ to approx 2$ per month is awesome. The old architecture was not overly complicated - but doing a build with a .deployment file pointing to a .bat file felt awkward. My source code was in bitbucket and a push to it triggered a deployment. Okayish, but too expensive for my tiny blog because of the fully fledged App Service. So if you want to have a neat little website or blog for small money, I am going to give you a step by step instruction how to get up and running. Bare with me, it is a rather long post. a free Azure Account. You can try for free for 12 months and get 5GB of storage to host your website. a free Azure DevOps Account. It’s free for up to 5 users and you get 1800 build minutes to update your blog. If you open source your code, then you get unlimited build minutes! VSCode (free) - or a similar and awesome code editor. It creates a Service Endpoint so Azure DevOps is allowed to create resources on Azure. 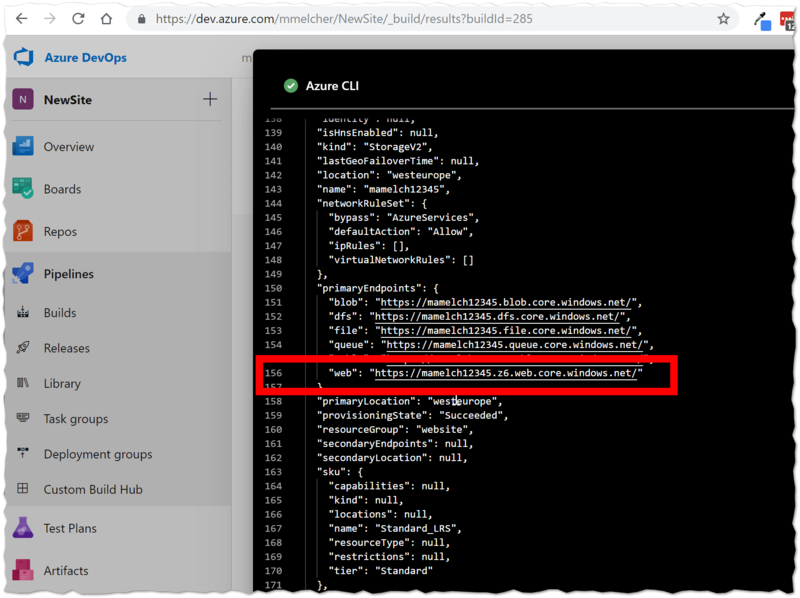 It creates a new git project locally and connects it with the Azure DevOps git repository. You have to replace [ORGANIZATION] with your organization, of course. Then click on “New Token” on the left and create a token with full access scope that is valid for 30 days. We do this only once, so it is not required to have a token that lives longer. After saving the form, you get the PAT. Please copy it to a safe place so that we can use it later. Once you leave the page, you can’t see it again and would have to create a new one. $organizationName with the name of your Azure DevOps organization. $azureDevOpsPersonalAccessToken with the PAT you generated before. Url: https://dev.azure.com/[Organization]/[Project]/_settings/adminservices Please note down the Azure Subscription that you selected, in my case that is Microsoft Azure Internal Consumption. Afterward, download the following yaml build file and open it with a text editor. In line 17 you have to specify the Azure subscription name. When in doubt, get it here. In line 20 you can specify the resource group name. In line 21 you must specify the storage account name. This name must be unique, otherwise, the creation will fail. In line 22 you can specify the storage location. In line 33 you have to specify the Azure subscription name, same as line 17. In line 35 you have to add the same storage account name from line 21. Once you commit this file and push it to Azure DevOps, a build is triggered. It will create a storage account for you with the static website feature enabled. The foundation is done, now let’s configure Hugo. but you could also just download the latest version of Github. hugo new site --force . to create a new, empty Hugo site. Hugo comes by default without a theme, so you have to get one from the theme catalog. I started with the theme “Ananke” and cloned it into the themes subfolder. Copy-Item -Recurse -Force .\themes\gohugo-theme-ananke\exampleSite\* . The rest of the theme options are explained in the theme repository - you can configure a lot of stuff. If you want to use my theme, I adjusted ‘[hugo-future-imperfect]‘(https://github.com/jpescador/hugo-future-imperfect) to my needs. 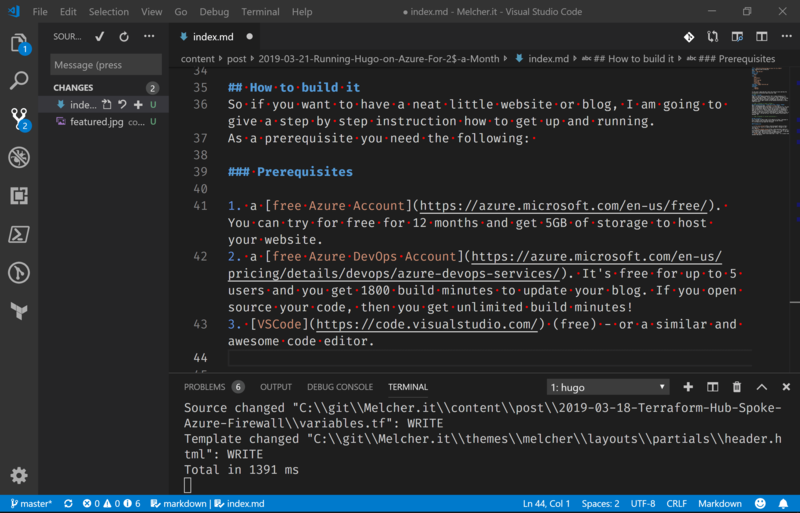 A build takes approximately 3 minutes here - after the first build you could disable the Azure CLI task, that would save 50% so publishing only takes 90 seconds. https://mamelch12345.z6.web.core.windows.net/ - your URL is of course different. Lastly, you should, of course, point your domain to the storage account. This can be done in the Azure portal (no automation AFAIK), documentation is available here. Unfortunately, with this approach, you do not get an SSL certificate for your domain and you cannot add it right away, yet. To add a certificate and a custom domain, you should follow this guide, to put Azure CDN in front of the Azure Storage. My domain is currently managed by Cloudflare, I added their cloud proxy in front of the Azure CDN - that further reduces my cost. To sum it up: In my current architecture, I use Azure DevOps to store my source code (free), using the build minutes (free) to put the resulting HTML files on Azure Storage (almost free). Then I use Azure CDN to speed up the delivery worldwide (almost free). 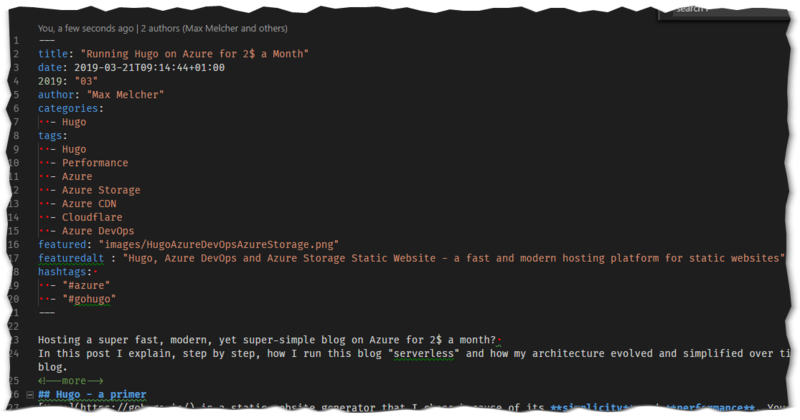 Additionally, I index my blog with Azure Search (free) to have a top-notch search function. In this post, I could only scratch the surface of what Hugo is capable of, so I really suggest you dive into the great documentation to learn more. So 5.63€ for March 2019? You said 2$ a month!!! Well, yes, on average it is that. But in March I experimented a lot and that resulted in several wipes of the entire Azure Storage. Additionally, I had GRS (geo-redundant storage) enabled on this storage account for reasons that are no longer available to me. The normal month is usually 2$ for me. All transaction- or transfer-related costs should be pretty much covered by the Cloudflare CDN proxy in front of the Azure CDN, so even huge spikes do not cost me anything. Awesome. For completeness, here is the calculation. 0.92$ - still not 2$. Yepp, I automated the post to Twitter and LinkedIn with a LogicApp and that one cost 1.11$ per month. And it checked my blog every minute for new posts by polling the RSS feed, reduced it to 60 minutes to save some pennies. I am questioning the numbers a little here - Internet Explorer is the fastest browser?! But in general, I am totally fine with the performance - how fast did the page load for you?! Security and Static Websites are a great start for decent security. No SQL injections, no connection strings, no web servers that you have to patch, no PHP - nothing. And a free SSL certificate secures all traffic (Cloudflare makes that one very easy!) - good, right? Additionally, I configured HTTP Strict Transport Security (HSTS), so accessing this blog without SSL is prohibited. The only thing that I need to protect is the access to the Azure storage account and my CDNs. 2-Factor and passwords even I do not know should be ok.
On the other hand, additional headers, like Referrer-Policy or X-Frame-Options, Content-Security-Policy cannot be set. And then there are some parts that are a little out of my hands. Like the DISQUS comment integration. If they screw up, it will affect my blog. But I am pretty sure they have decent security measures, so I accept that risk. Adding the free Azure Search as ‘search as you type’ addon. changing the ‘scroll-to-top’ function in the bottom right (turn sound on). Adding placeholders here and there that are managed centrally. Showing the recent 3 posts in the sidebar, but not the one that is shown on the right. 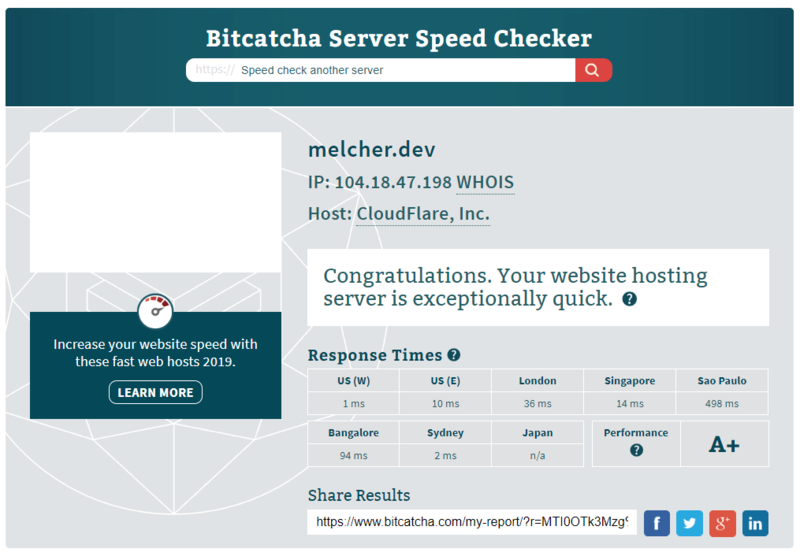 After migrating of Wordpress, I had lots of issues keeping my URL schema or my short URLs up and running. But I used a few lines of PowerShell to update the page metadata. I had to do this multiple times because of some edge cases, but with the power of git, a revert was super fast and effective. I really like the Front Matter, the metadata describing a post, in the readable form attached to a post. It makes just sense. In the screenshot, you can see all the metadata I provide for my posts. You can easily extend them and use them in your theme. I line 1 you can see that I do a where clause on all Pages that are not in the Section “s” nor in “draft”. In other words I hide my shorturls and my drafts. If you then add an Alias to the Front Matter, then the URL is still available after regular publishing. The same approach can be used for short-URLs, too.